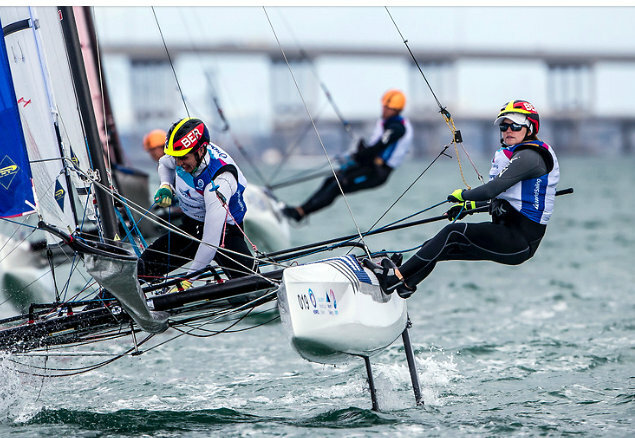 Bermuda’s Cecilia and Michael Wollmann competing in the Nacra 17 Mixed Class and Benn Smith competing in the Laser Men’s Class were back on the water competing in the 2019 Hempel World Cup Sailing Series Event in Miami. In a fleet of 27 sailors the Wollmann’s ended the day in 23rd place with 213 Net Points after twelve races. Three races were sailed in the Class for the day, with the Wollmann’s finished 11th in the first race of the day and the seventh of the series. The Wollmann’s would finish the second race of the day in 23rd, before finishing 23rd in the third and final race of the day. Smith came off the water after three races on the day and nine in the Series in 80th place down 2 places in a fleet of 101 sailors. Smith would finish the first race of the day and seventh of the Series in 33rd, he would then finish 38th in the second race of the day, before closing out with his best finish in the Regatta thus far finishing 10th in the ninth race of the series to finish with 227 Net Points.